Light morning rain begins to fall as a Gray Jay rustles in the trees just above us. The mountains cast a blue gray reflection on Sprague Lake, 8690 feet above sea level in Rocky Mountain National Park. The hike around the lake is an easy trek and the views are spectacular. My sister Jill and wife Niki are dressed in colorful rain gear contrasting against the variant greens of the willows and pines. A solitary fly fisherman tries his luck at the lake’s stream source. A German couple with their two young children walk the trail just ahead of us stopping to read the informative trail markers. It has been years since I visited my sister in Estes Park Colorado, and when I am here in the mountains I always wonder why it takes me so long to answer the call of the wild again. I love to hike. I love to be in the woods. It is where all time stops and wonder begins. Such a nice break from the complications of daily life. I breathe in the cool crisp mountain air and realize I have acclimated well this trip to the thinner atmosphere. The well-groomed trail around Sprague Lake takes us in and out of evergreens beside large mountain boulders. The German family stops ahead of us and looks at something in the brush off to the right. As we catch up to them, we spy a mother moose and her youngster enjoying a late morning meal of willow sprigs. We stand ever so still and quiet as the pair moves slowly through the greenery. It seems so surreal to be standing just fifty feet from wild moose and they don’t feel threatened, nor do we. We are in awe, watching the majestic animals in their natural habitat. As we continue on around the lake, the moose make their way down to the water for a snack of marsh grass. The lucky hikers who came out to Sprague Lake this day in the light rain are thrilled to witness just another day in the wild for the moose, but for us an experience we all will never forget. If you are looking for another easy hike around a very picturesque lake, don’t miss Bear Lake Nature Trail in Rocky Mountain National Park at 9475 feet above sea level and just over 1/2 mile long. You can get information and a map at the park entrance. We did this hike, too, and it was easy and beautiful. There are picture postcard photos around every corner, so make sure your phone is charged and your camera has fresh batteries. Another easy hike is around Lily Lake near Estes where we saw a bull moose eating his lunch. There are harder hikes for the more adventuresome as well. Plan your trip according to what you are able to do and never, never hike alone! Our week in Estes Park Colorado was filled with everything from t-shirt shops to standing at the Continental Divide after an extremely scenic drive up the Fall Creek and Trail Ridge roads. There is much to enjoy in Estes Park including great restaurants, craft beer breweries and wineries, golf, hiking, swimming and even a tour of the haunted Stanley Hotel popularized by Stephen King in his novel and subsequent movies The Shining. 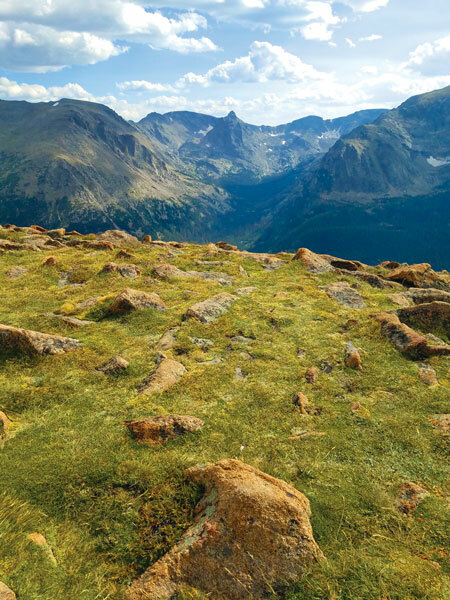 Just 900 miles from St. Louis, Estes Park is located northwest of Denver. We easily drove to Estes in two days with a stop in Kansas. We were amazed at how beautiful the Kansas landscape really can be. And now with the hundreds and hundreds of wind farm turbines, the middle-America scenery has taken on a greenish hue showing us a portrait of what America will look like in the years to come. We chose to rent a car from Budget for the trip giving our rather tired minivan a week’s rest. Even at 67 years of age, there is something alluring about a road trip. With AAA trip-tik in hand we set off for mountains leaving the sound bites of the daily news far behind us. No better time than now to get away, even for just a week. Our drive over Trail Ridge Road took us past the Continental Divide and over to the south side of Rocky Mountain National Park where we lunched in Grand Lake. This beautiful setting gave us a chance to sit on the elevated porch of the Grand Lake Lodge and enjoy cocktails and listen to the quaking aspens and watch the sail boats move along far below us on the lake. Temperatures in the part of the world are usually in the 70s during the day and 50s at night during the summer. We enjoyed most days with sun and mountain breezes. And the air is so crisp and clean. Some people do have problems with the high altitude air when you get to 7000 and more above sea level. You can actually buy a can of oxygen that can be inhaled if you become dizzy and oxygen deprived. I bought a preventative can just in case I got light headed, but never needed it on this trip. But I did sty well hydrated by drinking plenty of water along the way. It is easy to get dehydrated in the mountains as the humidity is very low and you really don’t sweat so you don’t even know you might be losing moisture. It worked for me and I greatly advise you go everywhere with a water bottle in tow. My sister and her husband Frank live in a beautiful mountain home just above the Stanley Hotel in Estes Park with a view of Long Peak out their living room window. It is common to see a herd of elk grazing or just resting in their backyard or somewhere in the neighborhood. These wonderful animals are not aggressive unless you come between a mama and her baby. Learning to live with the elk has become a part of life in Estes and these large animals are protected by the city and state. We didn’t see any bear while we were there and the bear population in the Estes area has dwindled, but my brother-in-law did capture a nocturnal black bear on his motion camera along with a bobcat. We were mostly entertained by the many hummingbirds at the feeders and a noisy murder of ravens from time to time. Downtown Estes has many unique shops and wonderful restaurants. And yes, we bought our t-shirts, saltwater taffy, fudge and even had one of those old time cowboy photos done. Sometimes you just have to do what you have to do on vacation. I was able to get in a round of golf at the Estes Park Golf Course and played in with a couple from Houston and a gentleman from Indianapolis. They all came to the Estes area some years ago to stay at the YMCA of the Rockies just a stone’s throw up the road. They all loved it so much they bought vacation homes here. This beautiful area has brought many flatlanders to the mountains. They answered the call, I hope you can, too. P.S. Just so you know, even though marijuana is legal for recreational use in Colorado, the Estes Park area does not allow its sale. You will have to stock up on your pot in Longmont or Loveland where pot shops are plentiful. If you are into that sort of thing. And remember, it is illegal to transport any amount of marijuana or marijuana infused products out of Colorado. For more information on Estes Park, please visit www.visitestespark.com or for info on Rocky Mountain National Park visit www.nps.gov/romo/index.htm. This entry was posted on Thursday, August 30th, 2018 at 5:26 pm and is filed under September 2018. You can follow any responses to this entry through the RSS 2.0 feed. Responses are currently closed, but you can trackback from your own site.